If you’re a true coffee lover, it’s well worth investing in a grinder. Far from being an unnecessary expense, it’s an investment that will ensure you drink your favorite elixir at its very finest. For espresso fiends, this is especially important so today, we’ve got a real treat for you. In our best coffee grinder for espresso reviews, we break down 5 of the strongest grinders at your disposal so you can save picking through scores of mediocre models and end up with something perfect for delivering that golden cup of coffee every single time. Although it’s not the cheapest grinder for espresso, the Breville Smart Grinder Pro is hands-down one of the very best. You’ll be able to make far more than just short espresso too with a choice of 60 grind settings catering for any type of coffee you fancy. 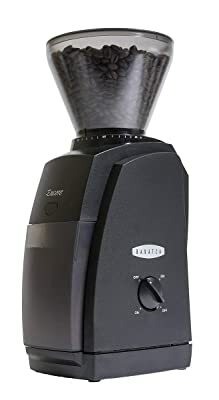 If you’re looking for a great grinder for espresso without spending a fortune, the Baratza gives you all the advantages of a conical burr but at a budget price. 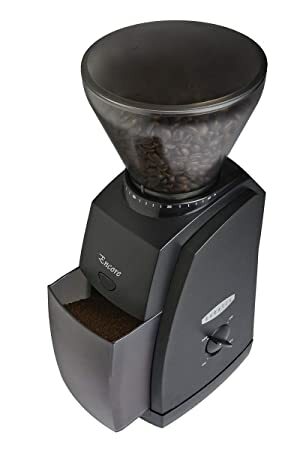 With 40 settings, this simple but effective grinder is great if you have more limited funds but don’t want to compromise the quality of the coffee in your cup. For a taste of a commercial espresso grinder without needing to spend four figures for the privilege, the Rancilio Rocky is our upgrade pick and delivers in fine style. While it’s not particularly cheap, you’ll get an espresso grinder built to stay the distance from a brand you can trust. Think of this as an investment not an expense and we’re confident you’ll be delighted with your purchase. Before we launch into our best coffee grinder for espresso reviews, we’ll give you a quick snapshot of the best coffee ground size for espresso so you can get that dialed in before you go grinder shopping. I. What Is The Best Coffee Ground Size for Espresso? Coffee Grinder and Portafilter Loaded with Freshly Coffee. Making Espresso Coffee Theme. Cafe Equipment. Just as important as grinding your beans directly before brewing and using the very best machine you can afford is the size of your grind if you insist on the perfect espresso. A fine grind works most effectively when you take your coffee short and strong. It doesn’t need to be extra-fine like you’d want for Turkish but you certainly don’t want it medium or coarse either. Before you get too excited, we’ll tell you front and center that getting the grind just right for espresso is pretty challenging. Leave it to a third party and they’re likely to mess things up so take charge and invest in one of the grinders for espresso we highlight today and you can be confident your fine grind will be just the way it should be. As a rough guideline, think of a consistency somewhere between sand and sugar. That should be considered only a benchmark since machines differ as will your taste. Experimentation is part of the fun anyway! The inbuilt problem with grinding for espresso is achieving consistency. This is one reason why burr grinders are the most reliable. The models we review all fall under this category. First up in our search for the best grinder for espresso is the hard-hitting Smart Grinder Pro from industry legend Breville. If you love espresso but also enjoy longer coffee and assorted brewing methods, you can choose from a full 60 grind settings to cater for pretty much any type of drink you want to make whether that’s a fine grind for espresso or something much coarser for the French press. Accuracy is uppermost thanks to the digital timer and all the information you need is writ large on a crisp LCD display. Despite all this functionality, the Smart Grinder Pro is also remarkably user-friendly. You’ll get everything you need in the box save the coffee beans to go in it so what are you waiting for? Based on a range of criteria, the Breville Smart Grinder Pro is our best overall pick, price notwithstanding. 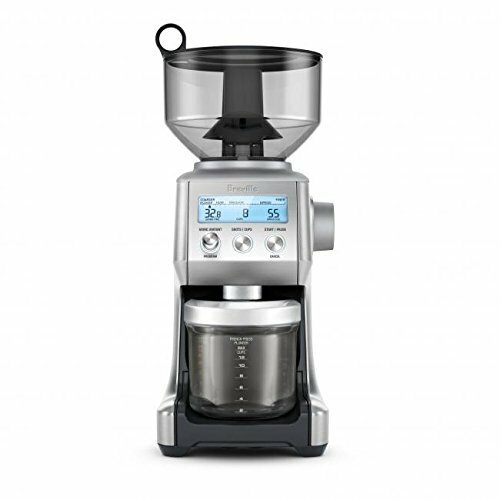 The Baratza Encore is a grinder ideal for more advanced users but also well-suited if you’re just starting out. You’ll get great brand heritage at a price you’ll love for the double-win. 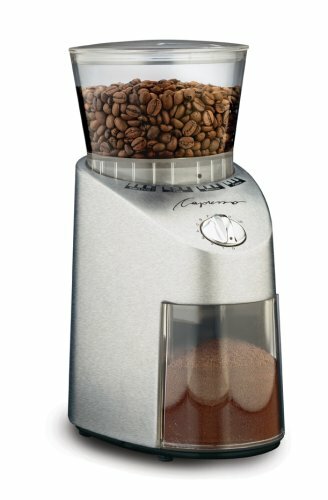 40 settings give you ample freedom to tailor the grind size to your preferred drink. If you love your coffee the way the Italians drink it, you’ll get a nice find grind for a lip-smacking espresso every time. While this grinder won’t eat up too much precious space on the counter, you’ll get a fairly generous 10oz of whole beans in the hopper, more than enough for most reasonable needs. The conical burrs are highly effective and you can also slip them out fuss-free rendering cleaning and maintenance a breeze. 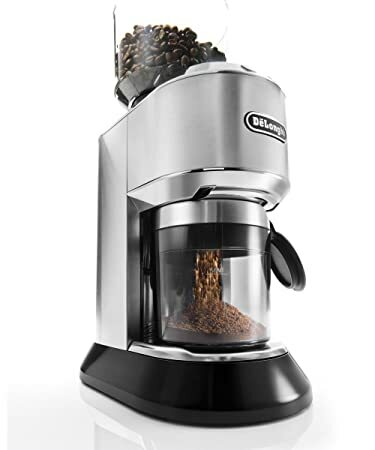 The motor is built to withstand the punishment grinding beans consistently doles out and you’ll get all the power you need to keep yourself in fresh coffee week in, week out. As long as your electrical system runs on 110 volts, we’d strongly suggest you road test this grinder at your earliest convenience. It punches above its weight and will not disappoint. 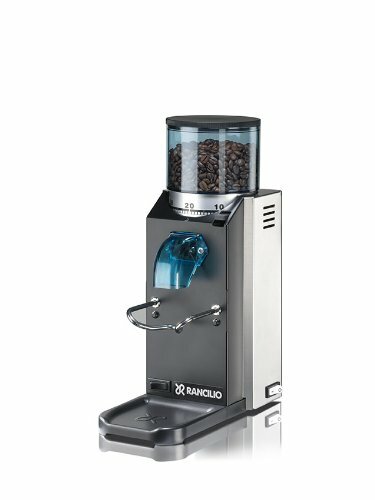 While it’s eye-wateringly expensive for a grinder, the Rancilio Rocky Espresso Grinder is a superb performer delivering commercial-grade performance for your home kitchen. You’ll be able to use this heavyweight doser-less grinder to surge through a large pile of coffee beans and you can keep up to a half-pound ready to roll in the neat, oversized hopper. Weighing in at 18 pounds, the Rocky feels rock-solid and you can opt for black-on-black or black with a flash of stainless steel. While tailor-made for a fine espresso grind, you can also pivot and grind right through to the coarse grind you’ll need for other brewing methods. Since you won’t be grinding into a dosing chamber, you’ll enjoy far more control as long as you’ve got some idea what you’re doing. We wouldn’t recommend the Rocky for absolute beginners. If you’re a committed coffee hound, though, you could do far worse than treat yourself to the Rancilio Rocky, our upgrade pick and worth every cent if your budget is a little more fluid and you insist on the very finest things in life. Next up is the DeLonghi America, another conical burr grinder that serves to complement the DeLonghi America Espresso Machine perfectly. It’s by no means necessary to buy that particular espresso machine but you can count on DeLonghi and the two are a match made in heaven. Grinders that are tiresome to clean tend to end up getting very little use. Nothing could be further from the truth with the America. You can remove the upper burrs with ease allowing you to blitz your grinder in no time and restore it to its former glory. With 18 settings, you’ll be able to grind fine for the best espresso while going for a medium or even coarse grind if you’re a pour-over or French press fan. This kind of versatility means you won’t need to compromise the type of coffee you drink. And, let’s face it, you’re not likely to be hammering espresso all day every day so this is a welcome and almost essential touch. You grind straight into the portafilter and you’ll get the adapter included so you won’t be rushing out to the store after unboxing. Just make sure you’ve got some coffee beans ready! For large families with varying tastes in coffee, the DeLonghi America is a must-have. It looks great but is certainly not a case of form over function. Check one out today and start enjoying even better coffee tomorrow! Last but by no means least in our best espresso grinders is another conical burr model, this time from the dependable Capresso. You can go through the whole gamut of grind sizes with the Infinity. There’s not an infinite choice but you can certainly mix things up to suit a broad spread of brewing methods. In our opinion, this grinder performs most effectively with finer grinds, hence we chose it for our best grinder for espresso reviews. There aren’t many arenas where you’d be proud if you product came in rated slowest, but when it comes to grinding coffee beans, the last thing you want is raw pace. That leads to excessive friction and unwanted build-up of heat. With the Capresso Infinity, you’ll get neither. What you will get is your beans slowly ground exactly the way you like them. We very much hope you’ve enjoyed this glimpse at the best coffee grinders for espresso as much as enjoyed producing it. 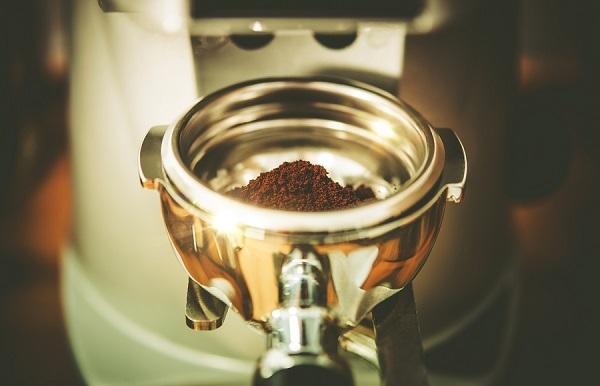 Even if your initial reaction is “I don’t need a grinder”, there’s little argument that grinding your beans directly before brewing is the surest way to that golden cup of coffee every time. Sure, you can buy pre-ground but you simply won’t get the very most out of the beans. If you look at a coffee grinder and consider you won’t get value for money from it, you’re much better off not buying one. Spend more on a coffee machine instead and stick with what works best for you. We’re never here to give you the hard sell on something you don’t feel comfortable with. If, on the other hand, you’re a purist who appreciates the very best in all that you do, making a modest investment in a first-class grinder is something you won’t need selling on anyway. Pay attention to getting the grind size fine enough but not too fine and you’re halfway there to an espresso the Italians would be proud of. It goes unsaid you should get the nicest beans up for grabs or all your hard work will go to waste. Also, assuming that most espresso lovers will also be partial to other brewing methods, if you opt for one of the grinders we reviewed today, you won’t be limited to a short, super-strong coffee. You’ll easily be able to vary the grind size and sort yourself out with a coarser grind for your French press or a medium grind for drip coffee. Come back soon as we’re in overdrive for the holiday season and we’ve got plenty more coming your way! What is the ideal grind for making espresso? My love of coffee started years ago. Today I still enjoy learning new ways to prepare tea, coffee and espresso. Recipes, new brewing techniques, a new way to use my equipment, I love learning all about it. I also love to share what I know with my readers. I hope you are enjoying my blog! It is important to also note Theprincela.com is a participant in the Amazon Services LLC Associates Program, an affiliate advertising program designed to provide a means for website owners to earn advertising fees by advertising and linking to Amazon.com, Amazon.co.uk, Amazon.ca, Endless.com, Smallparts.com, Myhabit.com, and any other website that may be affiliated with Amazon Service LLC Associates Program. We do not specifically market to children under 13.